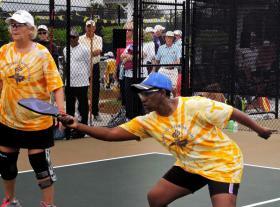 The third annual Low Country Pickleball Classic to be held in Sun City in April is expected to once again attract more than 200 players from across the U.S. and Canada. Tournament organizers recently won Hardeeville City Council’s stamp of approval to receive more than $4,000 in accommodations tax funding, which will go toward national advertising. The tax is a mandatory 2 percent charge applied to all local accommodations, such as hotel and motels. The funds must be allocated to tourism-related activities and expenses. Reuben Oder, vice president of the Sun City Pickleball Club and organizer of the tournament, said the funding will expand the event’s reach. Some of the money will be used to advertise on websites such as USAPA.org, where avid pickleball players and spectators from across the U.S. go for information about upcoming tournaments.